A 'No Deal' Brexit was the default position of the EU from the start. Listening to Remainer MPs, the public could be forgiven for thinking that an exit on WTO terms is an unnatural or unexpected outcome of Brexit talks. In fact it has always been the EU's position. No real alternative was provided by them, other than to stay in the EU which is effectively what Mrs May's Withdrawal Agreement represents. Whilst a Canada-style deal was finally offered by the EU in March, this effectively annexed Northern Ireland and Mrs May did not even pursue negotiations on this. The EU refused even to discuss a trade deal from the very beginning, claiming that it could not negotiate a trade deal until after the UK had left at the end of the two-year notice period. The EU successfully insisted to Mrs May that three very restricted areas be agreed before they would discuss anything else. These areas were the 'divorce bill' which they wished to extract from the UK taxpayer (with no basis in law), the rights of EU citizens (and future family members) in the UK to be governed by a foreign (EU) court in perpetuity, and a fictitious argument about the Northern Ireland border. Mrs May and her unelected civil servants allowed themselves to be distracted by these three EU-invented issues for eighteen months after the British people voted to leave the EU. These issues are still preventing any sensible agreement – in particular the non-issue of the N.I. border. The simple fact is that any 'deal' would naturally include ongoing trading arrangements. However the EU always insisted otherwise, meaning that a WTO exit was always the default option when it comes to trade. The EU operates on the basis of an increasing number of areas of life falling under the 'exclusive competence' of the EU Commission. This means a steady process of removing the sovereignty of the parliaments of Member States over more and more matters which would normally be considered to be part of nationhood. One of the earliest 'exclusive competences' taken by the EU Commission was that of trade. We suggest there is considerable irony in the Commission's use of the word 'competence', given that the EU Commission has shown itself to be anything but competent in negotiating trade deals. As an example, the earliest that the EU-Canada trade deal can be fully ratified is next year - a full 15 years after talks opened. If that's EU competence we hate to think what EU incompetence is. 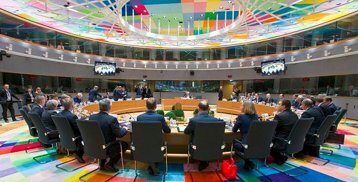 Brexit Facts4EU.Org has consistently argued that it was patently ridiculous that the EU should expect the UK should leave with no trading arrangements in place, but this was the EU's official position. The EU also insisted that the UK could not start trade negotiations with other countries before it left. Again this was ridiculous and was against legal advice from the eminent EU-specialist QC, Martin Howe of Lawyers for Britain. "Furthermore, is the UK also to be prevented from having discussions with the WTO to ensure the smooth transition of trading arrangements with WTO member countries on the UK's exit from the EU?" "It is inconceivable that a country of the importance of the UK could be prevented from preparing for its exit. This is tantamount to a deliberate act of damage to a neighbouring state and must equate to an unreasonable restraint of trade." "It would also prevent the UK from negotiating a trade deal with the EU itself, which would then leave EU exporters into the UK facing large tariffs in some cases. All of this would hardly pass any test of being 'fair and reasonable' and nor would it be in the political and economic interests of the EU." We were right then and we're right now. Sadly Mrs May ignored our advice. Remainer MPs seem to operate on the basis of “EU good, UK bad”, to paraphrase George Orwell. We would love to hear just one Remainer MP stand up in Parliament and try to justify the EU's totally unacceptable and unreasonable attempts to block the 5th-largest economy in the World from pursuing its normal commercial interests. We would like to hear these MPs say that they realise that an exit on WTO terms was in fact the default position of the EU all along. We would like to hear them say that as the EU refused to discuss a trade deal from the start, an exit on WTO terms of trade was the only possible route. We would like to hear them admit that "crashing out" on WTO terms – a characterisation we wholly reject – has always been the EU's position, unless we effectively agreed to stay in the EU, with its Singlke Market and Customs Union. We suspect we might have a very long wait, if we want to hear any Remainer MP admit that what we say is true. It doesn't make it any less true, however. WTO is the way to go. Its ridiculous to get rid of the "new deal" option because there's no way we want it. So those naive MPs, based on the same logic, would get rid of our nuclear deterrent unilaterally - what a pathetic bunch! That would be a disaster, surely there are more important things than nuclear deterrant, end of the day if britain would stop throwing its fat top heavy self around we wouldnt be looking over our shoulder all the time, let me guess, you're a tory.